The Circus House: Great Sockcess! 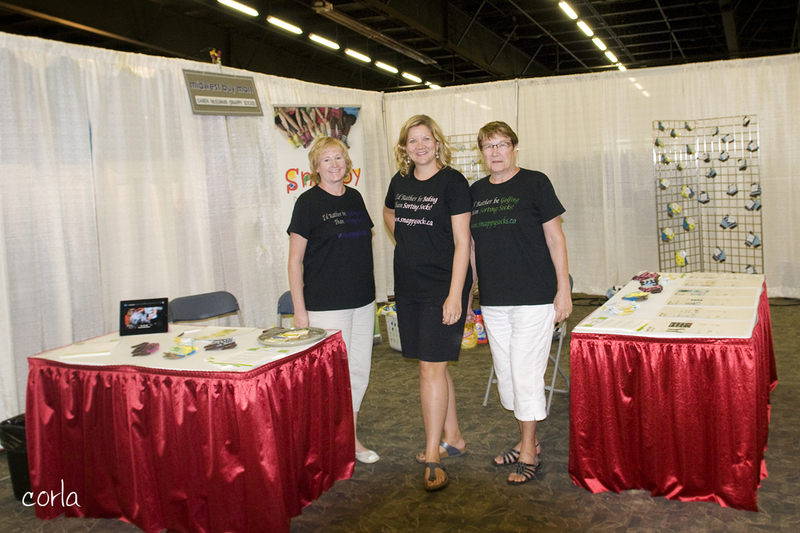 The Mid West Buy Mart was our very first trade show. After a year of designing socks, testing, planning, web design, photoshoots and waiting we were finally having a chance to meet with retailers and get feedback and orders. Since we were new to the show we didn't have many appointments but we did have a secret weapon. 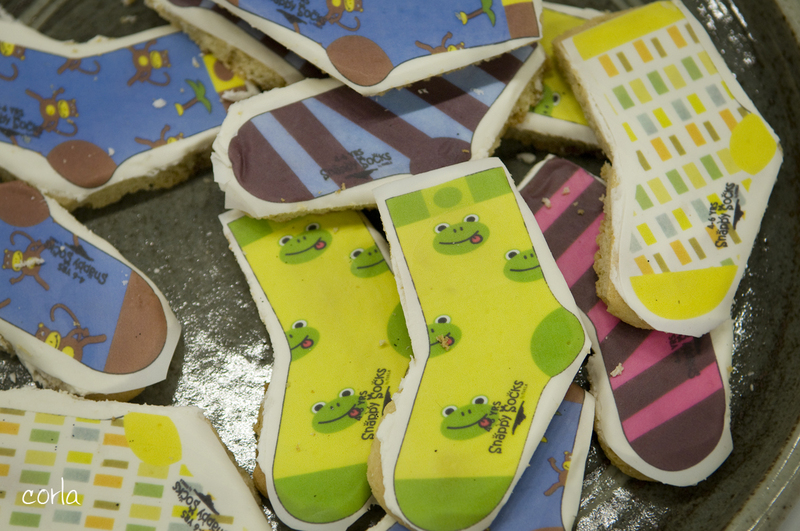 As buyers were walking by from one appointment to the next we offered them a sock cookie! Like everything about the booth the cookies too were a corroboration. I put a call out on facebook for a sock cookie cutter and by the next morning Sheena dropped one off in my mailbox. I went to Schimmels bakery and they were great. They did a sugar cookie and then a buttercream icing and topped it off with edible paper that replicated our 8 sock styles! 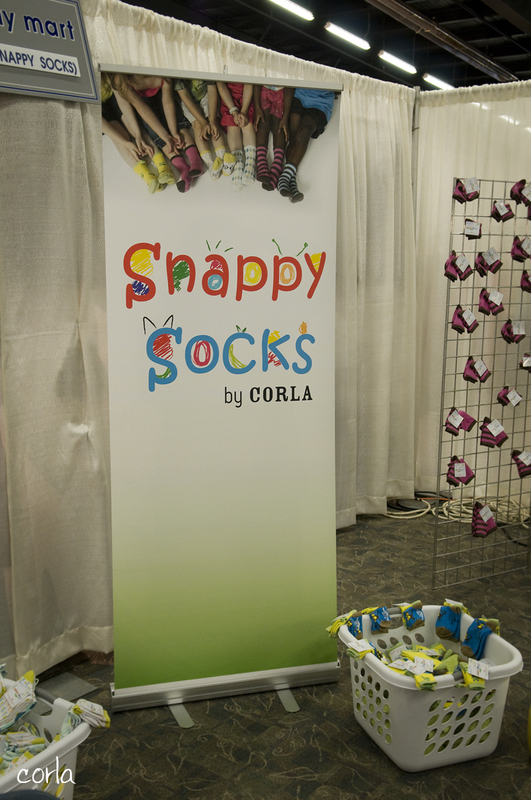 Copies Xpress made this cute banner for the booth. Thanks goes out to the number of moms who brought in their beatiful models for the sock photo shoot and Mathew from Wide Mouth Media for the design. When my mom and sales Rep arrived at the show the found the booth was huge! They ran to the store and picked up baskets and props to fill up the space. 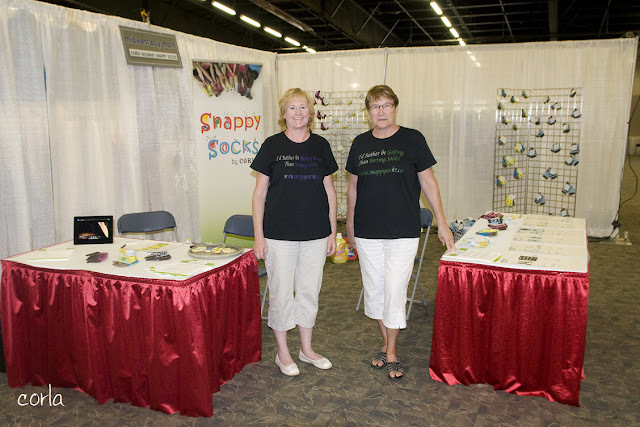 We had the episode of Dragons' Den playing on the ipad and our shirts from Stitch Master said, "I'd rather be..........than sorting socks" Karen's said riding horses, my mom's said golfing and mine said baking! On the back they said, "Ask me about our Deal on Dragons' Den!" They were a great conversation starter. Here we all are working the booth! Such a great show. The three of us had a lot of laughs and we signed up 10 new retailers and met so many others in the industry who were willing to share information and encourage us. Thanks to everyone who helped to make this happen! !